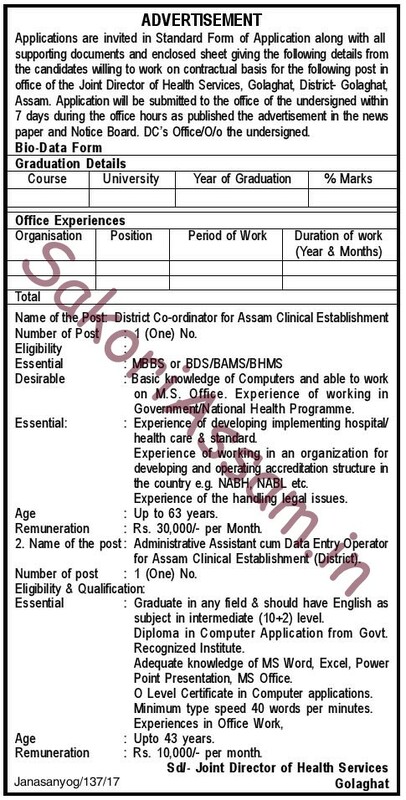 be submitted in the office of the Office of the Joint Director of Health Service, Golaghat within 7 days during the office hours as published in advertisement in the news paper and notice board. DC’s Office/O/o Joint Director of Health Service, Golaghat. Desirable: Basic knowledge of Computers and able to work on M.S. Office. Experience of working in Government/National Health Programme. Essential: Experience of developing implementing hospital/health care & standard. Experience of working in an organization for developing and operating accreditation structure in the country e.g. NABH, NABL etc. Experience of the handling legal issues. Qualification: Graduate in any field & should have English as subject in intermediate (10+2) level. Diploma in Computer Application from Govt. Recognized Institute. Adequate knowledge of MS Word, Excel, Power Point Presentation, MS Office. O Level Certificate in Computer Applications, Minimum type speed 40 words per minutes. Experience in Office Work. Remuneration: Rs, 10,000/- per month.